Experiencing a head injury is something no one ever wants to do – we certainly don’t want you to, either! But head injuries are actually more common than you think. More than 3.5 million children and adults sustain an Acquired Brain Injury each year, and at least 2.5 million children and adults sustain a Traumatic Brain Injury each year. Together, that’s six million people. 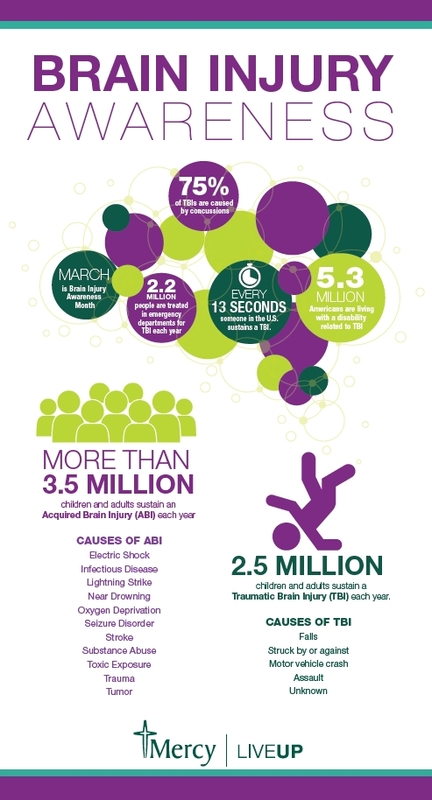 Download this brain injury awareness infographic to learn more about the causes of brain injuries and some interesting statistics. Should you ever experience a head injury, trust the Mercy Emergency team. Verified as a pediatric and adult Level II Trauma Center by the American College of Surgeons, Mercy has 24-hour coverage by general surgeons and anesthesiologists – and with access to specialists in neurosurgery, any and all head injuries are treated quickly and compassionately. To learn more, visit mercydesmoines.org/emergency/trauma. Previous story Why is an OB Emergency department important in choosing a hospital?